France is renowned world over as Europe's capital of fashion and romance. Perhaps due to her more popular fashion designs and romantic language, her culinary exploits have not received as much limelight. However, the French cuisines can hold their own in any gastronomy competition - and yea, it can rival the Italian dishes. Check out the 5 top dishes of French origin below. This is the French version of Pancake that is topped with almost anything you can think of...but mostly with fresh, ripe strawberries or ham and cheese. Be warned, you might get hooked to crepes and might demand to eat them on every meal. They say that if you have never tasted the French Croissant, then you have never pastry dishes. The Croissant is made from layered yeast-leavened dough. 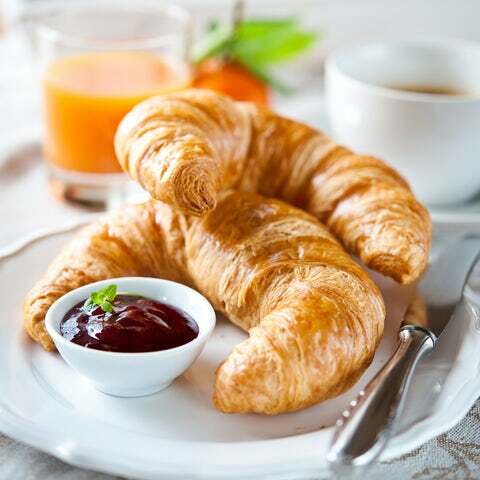 The Croissant is a popular feature in any continental breakfast and has been the staple in French bakeries...sort of what a burger is in American bakery. Sure this is a drink, but it is the most authentic French beverage invention. A taste of this espresso with steamed milk drink taken down with some croissants will make your breakfast a chore you look forward to. This is a nice smelling fish stew that is open to all kind of additives. The fish is served separately with rouille sauce and toasted bread. It is one of those dishes you would love to find in the evening after a long day at job. French dishes are as varied as they are numerous. You cannot sample all the French dishes even after eating a different meal for three months. It is an eye opening journey.